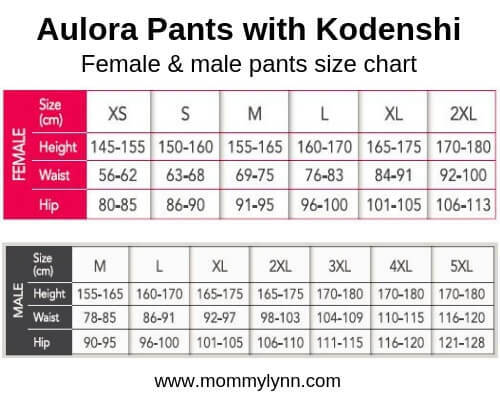 If you have decided to buy a pair of Aulora Pants slimming and wellness legging, the next step is to select the pants size suitable for you. The Japanese compression leggings in Malaysia, Singapore and Brunei are available in size XS, S, M, L, XL, and 2XL. For men design, the pants size goes all the way to 5XL. The size chart below is what I normally send to my customer for reference. Usually, I will ask my customer to measure only their waist and hip measurement. Unless you are an exceptionally tall men or women (over 6 feet), then you have to measure your height as well just to make sure the pants is not too short for you. If your waist or hip measurement is within the borderline of 2 pants sizes, for example, your waist measurement is 75 cm, then I would recommend you take the larger L size. Reason being, the bigger size leggings would be more comfortable to wear, especially if you are planning to wear for the entire day. If you are a men, I would strongly suggest you choose a bigger size because the leggings is a compression pants, so the area around your crotch would be quite tight. Hi Lynn, if my waist is 66cm and hip is 93, what size would you recommend? Size M is just nice for you. I you want to know how to place an order, you can contact me through WhatsApp from the number above. Hi Anny, based on your measurement, the pants size M will fit you nicely. Hi Gina, based on your measurement, I will recommend size XL for you. Hi Joei, size M will fit you nicely. Hi Lynn, if my waist is 80cm and hip is 103, should I go for L or XL? what size would you recommend? Hi Hil, I would recommend L size for you. Hi Lynn, is there size bigger than 2XL? Yes, there is a new size 3XL but men design. Hi Lynn, if waist is 83cm and hip is 107, should I go for XL or 2XL? Hi Sing, I will recommend size XL for you. Hi Lynn, if my waist is 93cm and hip is 100, should i go for XL or 2XL? Hi Cathy, I will recommend for you to take the size 2XL. Hello… my waist 75 and hip 100 what size suitable for me? Children age 7 can wear? Hi Gary, children age 7 can wear the Aulora Pants. Just take the waist and hip measurement to determine the pants size.